For Joy Ruble, providing a home for her daughter, Alexandra, in a small town was really important. 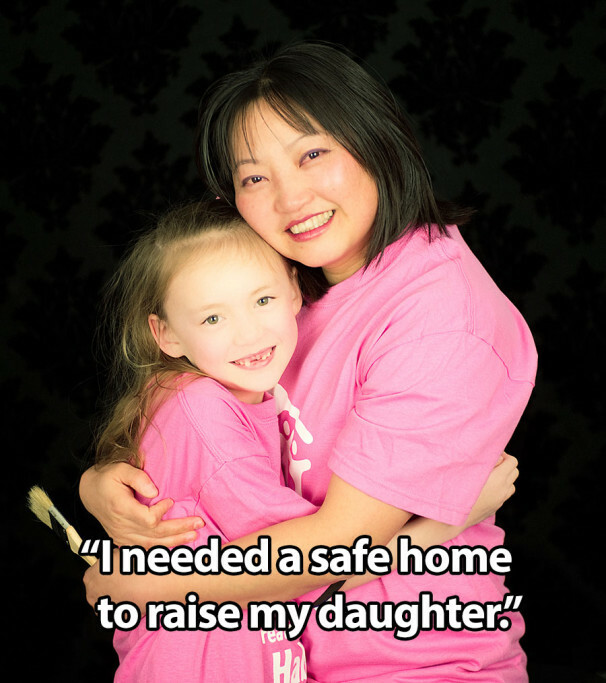 As a Chinese immigrant and recently divorced single mother, Joy took what money she had and purchased an older home in the small town of Gaston. Joy enjoyed small town living, and Alexandra flourished at school. The town provided Joy just what she was seeking for her small family. The house, however, quickly proved problematic: the furnace died and Joy overpaid for an improperly installed replacement, the broken windows were drafty at best, and the frozen kitchen pipes in winter- impossible. Sharing her frustration with her a friend and coworker, Joy was convinced to cautiously begin to look for help with her house. Joy came to Muncie Habitat looking for a solution to her housing problems. Habitat determined that her existing home was not structurally sound for rehabilitation. However, Muncie Habitat would be able to tear down Joy’s old house and build her a new one on the exact same lot. In fact, the project would become a Women Build build where teams of local women would raise money for the project and would do the construction work, alongside Joy, to build the house. It was a beautiful day in the summer of 2012, when Joy Ruble thanked all those who had helped with her new home, and then proudly accepted the keys to the next chapter of her life! Welcome home, Joy Ruble!